This past weekend I was watching Guardians of the Galaxy Vol. 2 (Baby Groot, am I right?) and after hearing about Freebird Chicken Shack's new home at the River Market in New Westminster, I knew we were coming to lunch after the film. 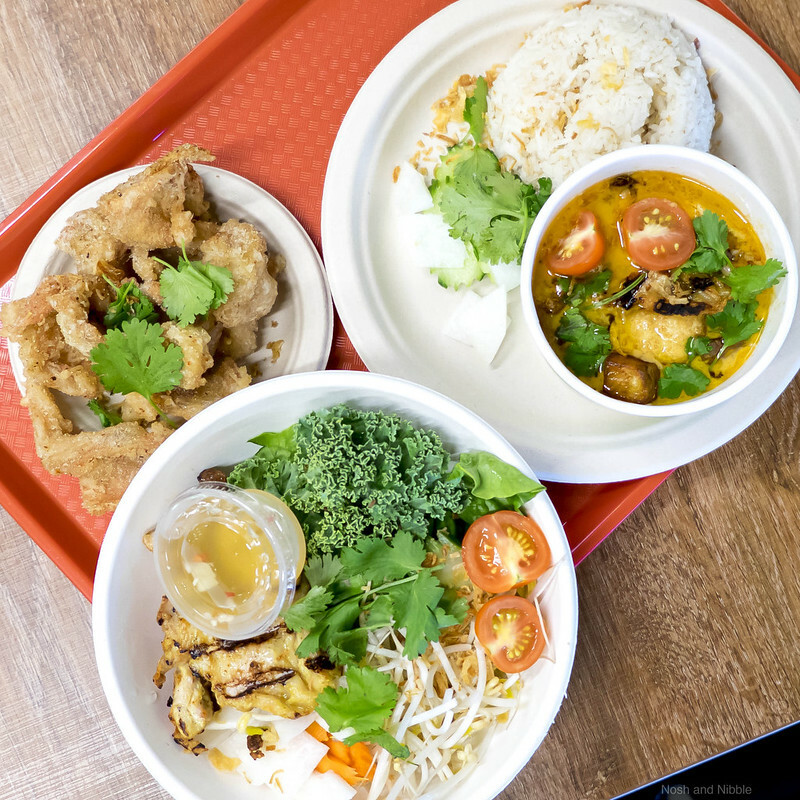 Read on to find my take on Chef Angus An's chicken specialty shop. 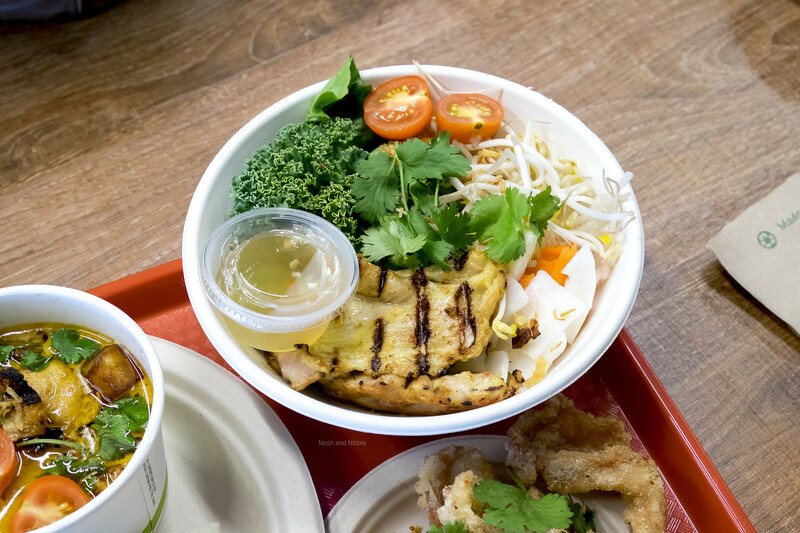 The Grilled Chicken Vermicelli Bowl came with fermented pork, herbs, greens, and Vietnamese nuoc cham (fish) sauce. There was a healthy dose of nuoc cham for everything but it did taste a little funny with the kale so I recommend clearing out the greens before pouring the nuoc cham sauce in. I found the noodles to be borderline hard which made them taste brittle. Maybe this was due to the rush of getting these made-to-order (more on that later). The most important part of this bowl was the grilled chicken which thankfully was juicy and full of flavour. The grill lines were pleasant to see and added a crisp char to the marinade. This was a little on the lean side so I'd recommend ordering a side to go with this if you're looking to get full. 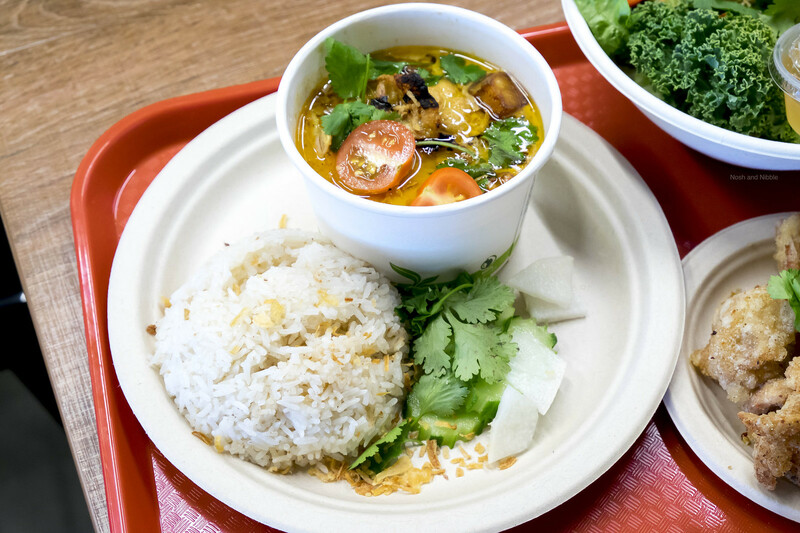 The Aromatic Curry of Chicken came with the classic rotisserie chicken, yellow curry, roasted potatoes, and chicken rice. This certainly had a pleasant aroma and there was enough curry to lather onto the rice and chicken. Another word for that rice though. Flavoured rice is a great way to make rice interesting and the chicken-flavoured rice did not disappoint. I could have enjoyed this by itself, but I didn't need to, as there were lots of curry to go around. The only knock on this curry was it was a tad greasy which may have also made it more filling. 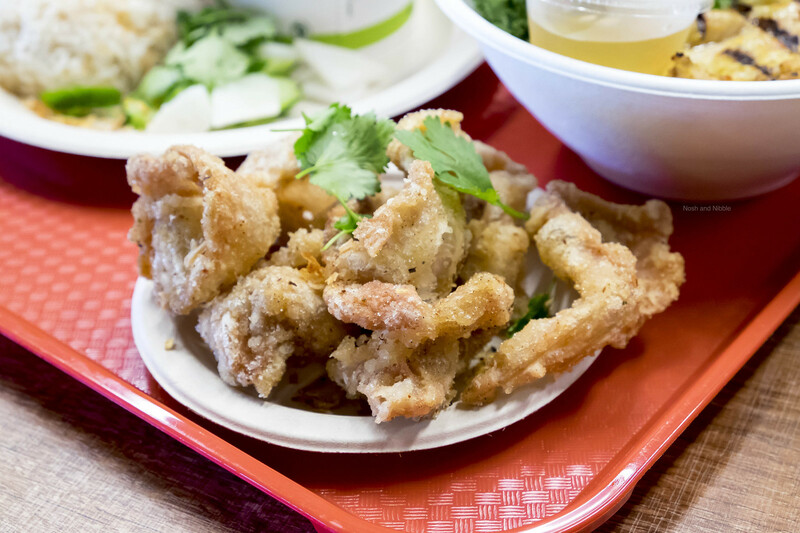 Finally, the Hot and Sour Fried Chicken Skin need special mention. They're mentioned last because these were the most dynamic and satisfying part of the meal. The citrus zing blended into a numbing spiciness that left my mouth smoking with residual heat for minutes. I prefer a spice level that lets me continue eating, but the seasoning on these fried chicken skins would be an exception because they were so good. 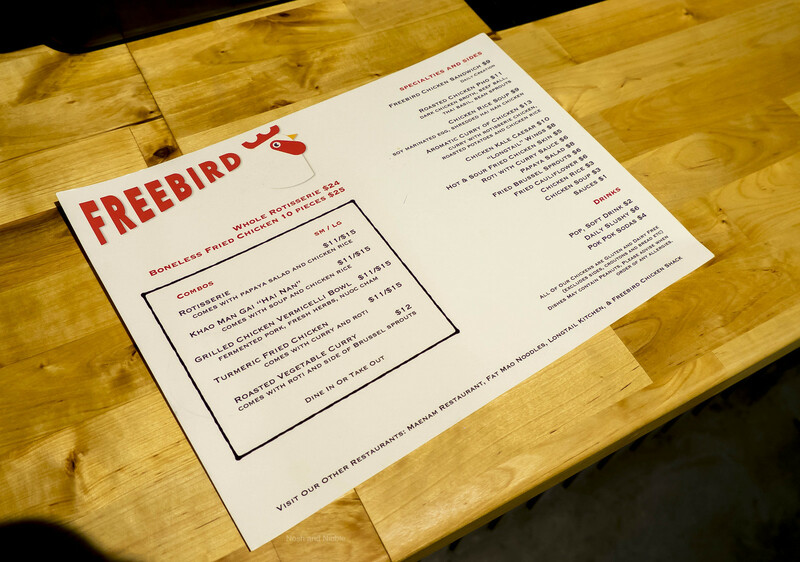 Freebird Chicken Shack takes up residence in the space formerly occupied by Wally's Burgers. For those unfamiliar with the River Market, it's a similar concept to Granville Island's Public Market, a little smaller of a retail footprint, but complete with the New Westminster Pier just outside. And seagulls everywhere. Oh those seagulls. Inside, Freebird Chicken Shack seats about 20 guests and has designated areas for ordering and picking up orders (keep your order number handy!). Speed of is where Freebird Chicken Shack fell apart for me. On a sunny Saturday afternoon, there were 2 guys staffed and both were in charge of serving and taking orders. My order took 30 minutes to call my number, and by this time I'd explored all the other menus available at the River Market wondering if I'd made a mistake. While I don't think the food was bad, the wait was excruciating and I'm pretty sure I was not the only one waiting on end for food. 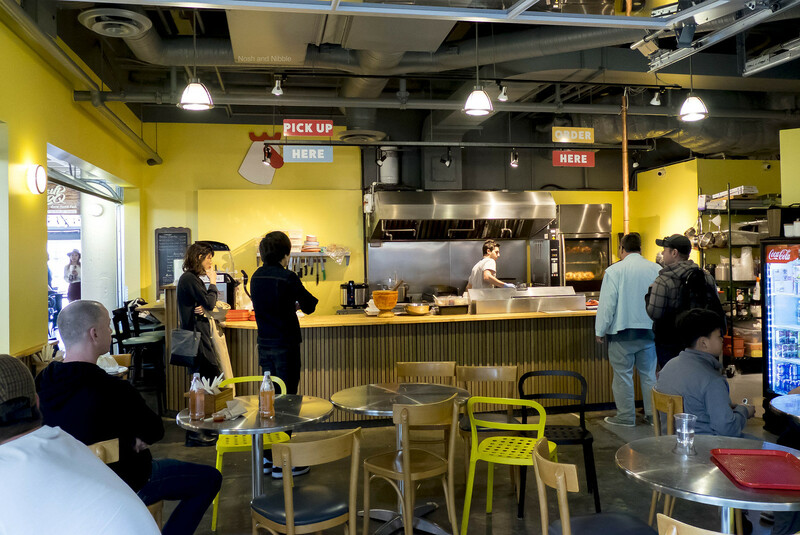 I hope Freebird Chicken Shack was just having a bad staffing day and that they're ready for future weekend afternoon crowds. Would I go back? Not unless I see at least 3 staff members behind the counter.